Serene sounds from a cascading waterfall fill your ears while you watch the koi fish plunge beneath the lily pads. The intoxicating scent of fresh water and nearby plants excite your senses. Appreciating an eco-friendly water garden from the comfort of your patio is realistic for all homeowners craving an immersive experience with nature. Fulfilling this desire starts with a clean and healthy pond. Aside from plants, koi, aeration, rocks, and gravel, a low-maintenance pond needs proper filtration to keep water clear and stable. There are three types of pond filters to choose from: biological, mechanical, and sterilizers. Biological filters decompose pond wastes using bacteria to convert them into more sustainable compounds that are useful for fertilizing aquatic plants. Mechanical filters catch and eliminate debris and sediment, while water sterilizers force water through a tube that sports an ultraviolet bulb designed to destroy living microscopic particles in the water. Filtering water successfully requires an effective biological filtration system combined with the right mechanical filter to eradicate solids before the water reaches the biological filtration unit. Sufficient biological and mechanical filtration eliminates the need for sterilizers altogether and guarantees a natural ecosystem pond. Pond skimmers get rid of debris before it descends to the bottom of the pond to prevent it from decaying. The skimmer also shelters and conceals the pump and plumbing from plain sight to achieve a natural look for your pond. The two main types of skimmers are box skimmers and floating skimmers. They both function similarly by removing debris from the surface of the water before it can reach the bottom of the pond. Box skimmers require less upkeep making them the preferred choice among pond owners. A box-style skimmer can use either a vertical or horizontal filter mat. Most pond owners tend to use horizontal filter mats because they avoid severe clogs that block off water flow to the pump chamber. Vertical mats, however, can lose their shape easily and prevent water from reaching the pump chamber. As a result, they require more maintenance and monitoring to ensure enough water is reaching your pond’s pump. When water enters the skimmer, the large debris accumulates in the skimmer basket and then the water is filtered through the horizontal mat. From there, the pond water runs through the underground plumbing and up into the biological filter where it’s further purified before re-entering the pond. After passing through the skimmer, water enters the biological filter from the flexible pipe located near the base of the unit. The water then goes from the bottom of the filter to the top by journeying through the filter media inside the unit. The filter media removes small to medium-sized particles from the water. The biological filter begins to fill with water that runs-off over the lip of the waterfall. This creates the beautiful scene of a natural-looking waterfall as the water cascades down into the rocks. Waterfalls also help in the aeration of the pond allowing for circulation and healthy water. Aquascape offers biological filters ranging in size that can filter ponds up to 10,000 gallons. Multiple biological filters would need to be incorporated into the design of a pond exceeding this size. 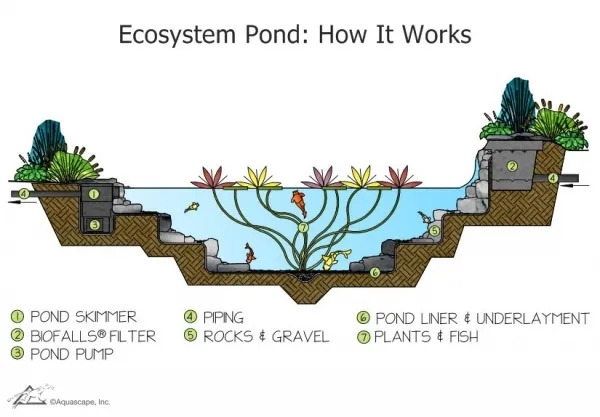 The purpose of mechanical and biological filtration is to break down the compounds found in a pond ecosystem, such as fish waste, uneaten fish food, leaves, and other debris. Controlling the levels of ammonia (a form of nitrogen) in the pond water are crucial to limiting algae growth; high ammonia levels in the water are also very toxic to fish. Biological filtration utilizes nitrogen as its primary nutrient in water gardening to limit ammonia’s adverse effects. During biological filtration, nitrifying bacteria absorbs ammonia to turn the nitrites into less harmful nitrates. It’s essential that these bacteria receive the oxygen they need to survive, so this means running your pond’s pump 24/7. 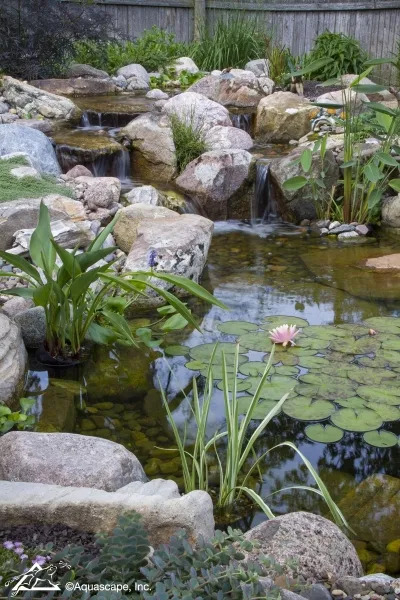 Without the pump turned on, your waterfalls will stop flowing and aerating the pond, which will kill the bacteria after it uses up all the oxygen in the water. After the nitrification process, nitrates are then eliminated from the pond through de-nitrification, another biological filtration method. This process takes place in anaerobic (without oxygen) spots of the pond. The bacteria in these areas of your pond turn nitrates into nitrogen gas allowing it to escape into the atmosphere. Aquatic plants also assist in the de-nitrification process by absorbing nitrates as they grow. This is why ponds without plants end up being a maintenance nightmare. For optimal biological filtration, billions of bacteria need to be at work to purify the water. Since bacteria likes to anchor onto things in your pond, surface area becomes an important factor for filtration. More surface area means more bacteria fighting in the biological filtration process. Filter media, rocks, and gravel provide the surface area needed to house these bacteria. Therefore, ponds with gravel on the bottom will contain more surface area for bacteria than a pond with liner on the bottom. Aquatic plants play a significant role in the pond filtration process. They assist in purifying pond water by reducing nutrients, filtering out sediments, and absorbing toxic compounds through phytoremediation. Without the plant’s removal of excess nutrients, algae will begin to feed on them leading to green water, string algae, or both. Aside from algae control, plants also provide food, shade, and protection for the fish and other creatures in and around the pond. 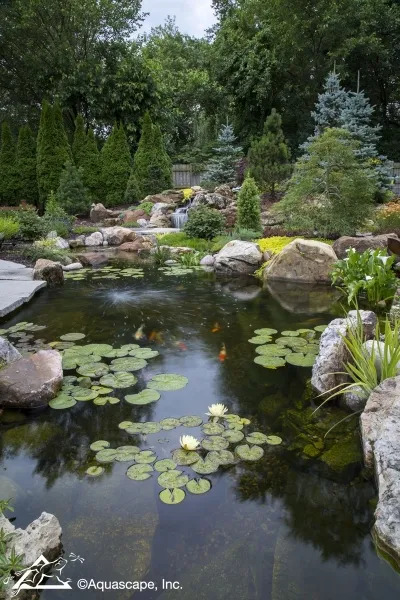 To maintain clarity in pond water, the process of running water through the mechanical and biological filters must be repeated to create a balanced, low-maintenance ecosystem pond. With the addition of plants, fish, aeration, rock, and gravel, you’ll experience even better results with water quality in your pond. Bring your fish happiness and health by providing them with a sustainable environment. You’ll get more enjoyment watching them swim in clearer water created by proper pond filtration practices.